What a lovely thought but a tall order right? Have you ever screwed up? Royally. Have you ever behaved so badly that within yourself, you found disgust? Have you ever felt without worth and that nobody could possibly love you, just as you are? Ever felt rejected or not good enough? I could go on… with ease. In my life I have felt all these emotions at one time or another. Some more than once. Self acceptance and forgiving myself is not a strength of mine. I was clearly a Catholic in a past life, riddled with guilt. My Oupa Mike and my Ouma Chrissie taught me many valuable things. They also showed me who I could be through their actions and behaviour. Overall, I believe I failed them. I may have been a Jew in another lifetime. All that guilt. You see it had nothing to do with what they would say or think, but more to do with disappointing them. I never wanted to let them down, embarrass them and ever disappoint them. I wanted to be worthy of their absolute pride, devotion and love. I was their eldest granddaughter. They always made a fuss over me simply because I came before the rest. (Sorry guys… but I win!) My Ouma Chrissie declared the day I was born the happiest of her life. What a lovely thought but a tall order right? The details of my life include two divorces. Regardless of reasons, showing up and facing my grandparents with what I viewed as my very public failures, was horrible for me. I would rather have received lashings, dramatically endured. Facing them was far worse than the actual incidents themselves. Cowardly I would stretch out physically visiting but when I did, I was always received with unconditional love, literal open arms, huge hugs and my favourite pudding. There was no question of their support, reassurance and they never understood my need for forgiveness. I was humbled. They never asked for details and would never interfere or give advise unless asked. My respect and admiration for them are endless. What I learned was that my actions, behavior or failures did not forever condemn me. I am human and as such will make mistakes. Sometimes the same one more than once …. but their love for me was not attached to conditions or expectations. They simply loved me. They made allowance that sometimes I would loose my way. I was never loved less. I was loved more if that was possible, because I needed to be loved even when I wasn’t very lovable. My failures did not define me. Sometimes my actions and behaviour were not ideal, and sure, not to be encouraged, but by no means did my failures diminish my worth or ability to be loved. I was always worthy. Always loved. Forever forgiven. I may not go to church, but that is how I think, or sincerely hope, God will feel about me. Only 26 days to my birthday… I found this birthday card in Ouma Chrissie’s handwriting the other day. Thank you for these physical reminders of who you are in my life. 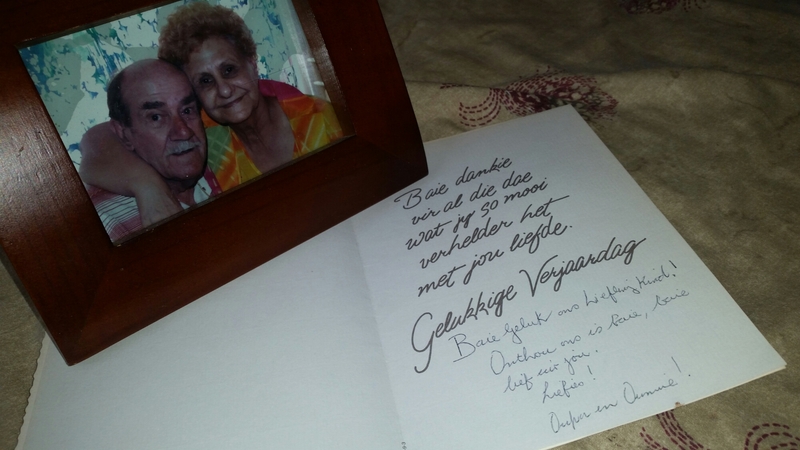 Ek verlang met baie liefde. Previous Article The food isn’t up to standard? Next Article Midnight train (thoughts) to Georgia (nowhere). love never asks why. Try not topass up the opportunity to tell them how much you love them too! Thankfully I never did. My Oupa Mike died 7 years ago now and my Ouma Chrissie 5 years. I miss them very much. Weet jy, ons deel so baie en sommige van jou innerlike wroegings en einas is myne ook. Dankie tog vir Oumas en Oupas wie nooit vinger gewys het nie. Wie altyd ‘n spesiale plek gehad het vir hulle oudste kleinkind. Diep binne het hulle geweet ons is definitief nie altyd engeltjies nie, maar niemand het dit ooit durf waag se in hul geselskap nie. Ek mis om by Ouma se voete te sit en te leef.